Mr. Justice Mohsin Akhtar Kayani in his judgment has decided the issues regarding territorial jurisdiction in guardianship matters in Writ Petition No. 3492 of 2018. 1. 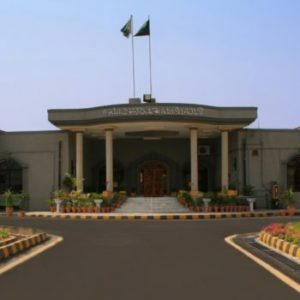 Through this writ petition, the petitioners have assailed the concurrent findings passed by the learned Judge Guardian Court vide judgment and decree dated 21.03.2018 and learned Additional District Judge (West), Islamabad vide judgment and decree dated 24.07.2018, whereby the Guardian Court ex-parte decided the custody petition U/S 25 of the Guardians & Wards Act, 1890 and appeal of the petitioners against the said ex-parte judgment and decree was dismissed by learned Additional District Judge (West), Islamabad. 2. Brief facts referred in the captioned writ petition are that, Mst. Nasreen/petitioner No.1 was married to Raja Muhammad Shahid Bashir/ respondent No.3 on 04.04.2004 against the dower of Rs.50,000/- and during the subsistence of marriage, Muhammad Sarim (son)/petitioner No.2 was born on 27.05.2006, who is presently in custody of petitioner No.1 at Karachi. Respondent No.3/father filed a custody petition U/S 25 of the Guardians & Wards Act, 1890 on 09.05.2017 at Islamabad and Mst. Nasreen/petitioner No.1 deserted him in the first week of August, 2008 and she by removing the minor from legal guardianship took away the minor son to Karachi to her parents’ house when respondent No.3/father was allegedly performing his duties at Naval Hospital PNS Hafeez, Islamabad. The custody petition was ex-parte decided in favour of respondent No.3/father vide judgment and decree dated 21.03.2018 by the Guardian Judge (West), Islamabad as petitioners failed to appear before the Court. Feeling aggrieved whereby, petitioners filed Appeal No.7/2018, which was dismissed by the learned Additional District Judge (West), Islamabad vide judgment and decree dated 24.07.2018. Hence, the instant writ petition. 3. Learned counsel for petitioner contended that both the courts below neither appreciated the law on subject nor the facts which were brought on record at the appellate stage, whereby it was specifically contended that the custody matter was settled through consolidated judgment dated 06.11.2013 passed by the learned Judge Family Court, XVI, Karachi South passed in Family Suit No.384/2011 and Guardian Petition No.428/2011, whereby the custody application filed by respondent No.3/father was dismissed and he was granted a visitation schedule to meet the minor on first and third Saturday from 10 am to 12 noon of each calendar month in Court premises with direction to pay Rs.5,000/- as conveyance charges. The said order was upheld by the learned Additional District Judge (VII), Karachi South vide order dated 21.10.2015, whereas the Sindh High Court vide order dated 01.04.2016 dismissed in limine the C.P. No.S-1198/2015 of respondent No.3/father, but all these facts have been concealed by respondent No.3/father and even the same were not appreciated by the learned Additional District Judge, Islamabad, hence, the impugned judgments are contrary to law and against the settled principles of the judgments passed by the superior Courts; that minor is studying in Army Public School, Malir, Karachi and at present he is 13 years old and respondent No.3/father has not paid due maintenance despite the decree passed against him and as such, he is neither entitled for any relief nor custody should be handed over to him in these circumstances as welfare of minor lies with the mother. 4. Conversely, learned counsel for respondent No.3 contends that minor was removed from Islamabad in the first week of August, 2008 and as such, this Court has jurisdiction to entertain the matter and the petitioner mother never allowed the visitation despite the fact that respondent No.3 has paid maintenance in the Family Court, Karachi, which was received by petitioner No.1/mother; that petitioners intentionally failed to appear before the trial Court at Islamabad, which resulted into issuance of ex-parte decree, which was further upheld by the first Appellate Court and constitutional courts cannot interfere into concurrent findings. 5. Arguments heard, record perused. “4. That in the first week of August 2008, the Respondent deserted the petitioner and took away his said minor son with her at Karachi, where her parents live, the said minor was removed from the legal Guardianship of the petitioner by the Respondent, while the petitioner was on duty in the Naval Hospital P.N.S. Hafeez at Islamabad. 7. The above referred custody petition was filed on 09.05.2017 before the Guardian Court, Islamabad, however the said petition was proceeded and decided ex-parte, vide judgment and decree dated 21.03.2018, which was upheld by the first Appellate Court vide judgment and decree dated 24.07.2018. Hence, this writ petition. This entry was posted in Case Laws, Constitutional Law, cost, Family, Fine, Guardianship, Islamabad High Court, Knowledge - Constitutional Law, Litigation & Arbitration, Minor, Minor Welfare, Penalty, Recording of Minors Statement for Determining Welfare, Solutions - Constitutional Law. Bookmark the permalink.